Millmount – The Most Historic Little Site in Ireland? *Note earlier than usual start at 7PM! The next in the series of Walk and Talks will take place next Wednesday evening, 22nd August with Eamon Thornton leading a walk around the Millmount Complex, when he will make a case that Millmount is indeed the most historic site of its size in all of the country. Millmount has been a very important location since Neolithic times and has added its stamp not only to Drogheda’s heritage but has been significant in Ireland’s story under many headings – history, mythology and legend, military, political and even sport. Its own story provides a wonderful insight into the development of the country through the ages. Eamon will inform his audience of the origins of the site, the mythology and folklore associated with this extraordinary place from its prehistoric roots through the foundation of the town of Drogheda, its development through the ages, the major military battles that took place there, the people who lived in the buildings on the site, its later emergence as a famous sporting venue where a world champion learned and practiced his sport and the emergence of Millmount in the 21st century as the site of the leading voluntary-run museum in the country. The tour will end with a visit to the wonderful gun platform of the Napoleonic Tower with its panoramic vista overlooking the countryside for many miles in all directions. Here Eamon will talk about the significance of Amergin, his role in the Irish Mythology Cycle and his links with Millmount. The amazing range of history and heritage contained within the walls of the Millmount Complex will amaze and excite participants in this Heritage Week event. Participants should gather in Millmount at 7.00 p.m. Note the earlier time than usual to allow for the earlier onset of darkness. The tour will last about 90 minutes. 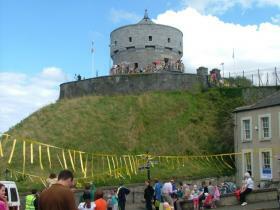 There is no charge but voluntary donations for the upkeep of Drogheda Museum Millmount will be accepted.